“STAR goes to STAR”! It was “Meet and Greet Night” at the STAR Speedway in Epping, NH on June 20th as this would be the next stop on the Senior Tour Auto Racers schedule. The weather was iffy and not sure if we would get racing in that night. The Southern and Northern tracks were cancelling out their night due to heavy rains and wind, but the sun was still shining in Epping, NH. It was like Mother Nature just made a “what we call it in racing” a sharp turn left. Senior Tour cars rolled in from all over New England to give the fans some “Good Ole Fashion Racing”. 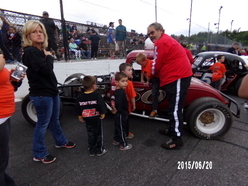 It was so nice to see so many STAR Speedway drivers and fans come to the Senior Tour’s pits to talk to the members and view the cars. The tour was in for heats and features for both divisions that night along with the on track “Meet and Greet”, which is always a hit! With Mother Nature still shining on us it was off to racing as the tour made its first hit to the asphalt with the Sportsmen division with their heat race. John Mulcahy from Ma in his #57 Mustang captured the first flag for the evening and the heat win for the Sportsmen division. Richard Eastman from Ma in his #0 Pinto took a very close second and to round out the pack with a third was Skip Stearns from NH in his #7coupe. 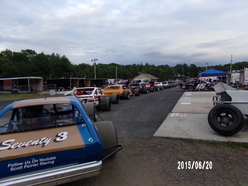 The Modifieds were lined up and ready to hit the track for their heat race. It was Bobby Turner from Me in his #7 Omni to take down the second win for the tour that evening. Scott Poirier from Ct in his #73 Pinto would capture a very close second and rounding out the Modifieds with a third was Bob Donahue from NH in his #99 Pinto. With Mother Nature “Still” shining on us, the races continued at STAR Speedway. 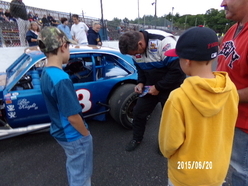 Then it was Star’s Speedway‘s “Meet and Greet” time for the Senior Tour. 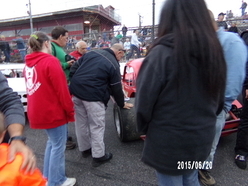 One by one Senior Tour cars came out filling up the complete front stretch to meet the fans of Star Speedway. The track opened up the gates and let the fans come down to meet the Senior Tour drivers. As I walked up and down the front stretch you could see the kids getting a kick out of sitting in the cars and taking pictures. There was signing of shirts, flags and photos and “oh what stories were told,” always a hit! Then it was time for feature racing! First up was the Sportsmen division. In his red #43 coupe “which he calls Fred” it was Alan Zemla from Me to take down the checkered for the Sportsmen division feature. Skip Stearns from NH in the #7 coupe and John Mulcahy from Ma in his #57 Mustang battled out for second. When the flag came down it was Stearns to pick up a second and Mulcahy finished off with a third. The top three were brought track side for an out of car interview and awarded with trophies. 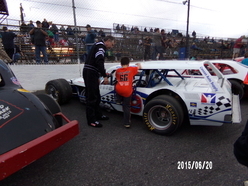 Now it was time for the Modifieds to hit the asphalt for their feature race. In his new sleek black Pinto it was Bob Donahue from NH in the #99 to take down the last checkered flag and the win for the Modified division. Behind him were the two white #7’s. Bobby Turner from Me and Brian Robie from NH, side by side to a photo finish. It was Robie taking a second and Turner finishing off the pack with a third. The top three were brought track side for an out of car interview and awarded with trophies. Senior Tour Auto Racers would like to thank STAR Speedway and their entire staff for the warm welcome and all their hospitality; it was a great night of racing! Also thanks to Mother Nature for taking a left turn so we could race that night!